Dorm Co. Tip: Dorm Rugs are College Essentials! Black and white dorm decor doesn't have to mean zebra print! 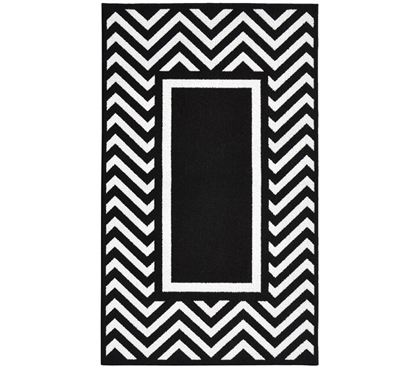 With the Chevron Frame College Rug in Black and White you can have contrasting dorm decor that is stylish but not over the top. Match your dorm carpet with other black and white dorm decorations and twin XL bedding to have matching college supplies that are stylish and look crisp and clean. Sized 5' x 7' this dorm area rug will allow you to cover most of the floor space in your dorm room, giving you a comfortable surface for walking and sitting. With a loop construction made from polypropylene this is one college rug that will stay strong and durable throughout your years in college. 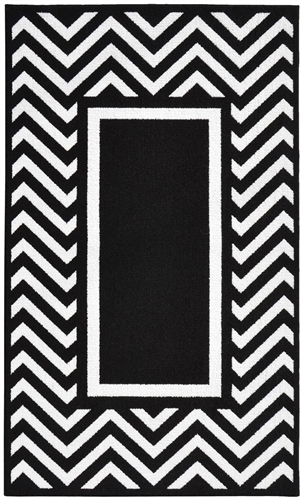 You don't have to spend a huge amount of money to get style and comfort in a dorm room rug, instead buy the Chevron Frame College Rug in Black and White, a cheap rug for college to match all of your dorm decor!